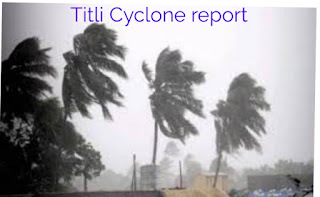 Titli Cyclone is Rarest of rare cyclone over the past 200 histroy, report of RIMES. As , the Titli Cyclone devastated Odisha in ocoOcto 2018. Why Titli Cyclone is Rarest ? More than 200 years of History tells that Titli Cyclone is rarest as it has devastated Odisha coast much more. Cyclone comes in specified way but Titli Cyclone came suddenly and it recurvated after landfall. We know Cyclone generate only in that area where is low pressure present and temperature should more than 26 and Continuously availability of moisture should be available so that, Cyclone can be sustained. These 3 are important factor to make Cyclone. Indian coastal department prepared for Titli Cyclone but in case of Titli Cyclone, route of cyclone was changed and it rare thing of Cyclone, that’s why administration could not do much more to handle it. When Titli Cyclone struck to Odisha state of India and there was favourable condition to the Titli in case of moisture on Odisha land because of heavy rain that was the reason why Titli Cyclone sustained for 2 days. RIMES, is a United Nations registered inter-governmental body. It is owned and managed by 45 collaborating Countries in Africa region and Asia Pacific. It’s programme unit of the agency located in Thiland. Right Now, India is chairing RIMES. It was formed on 30th April 2009. So, It was the important factor of Titli Cyclone, as it is analysed by RIMES and scholars.